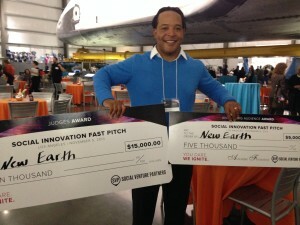 New Earth founder, Harry Grammer at the conclusion of the Fast Pitch event. At New Earth, we like to think we do good things. After all, our arts and education based mentorship programs that are designed to support teens transitioning from incarceration to life at home have yielded compelling results: Our recidivism rate is a mere 15% among 13-18 year olds while L.A. County has an 86% juvenile recidivism rate. We work with more than 700 youth per week in nine camps. We also liked to think that we had a pretty good handle on how to communicate what we do here, until we began participating in the Social Innovation Fast Pitch competition and realized that many people were unclear about what we really do. The Fast Pitch event is like speed dating in that each organization is given 3 minutes to demonstrate social impact, innovation and presentation efficacy in front of a panel of judges and an audience of our peers, donors and community members. The process leading up to the event is akin to marathon training: for two months we worked with our coaches to refine our message over and over again, until something clicked. We realized that what we needed to focus in on was our mission and that our best assets were the young people that we have worked with over the past ten years. To give you an idea of how the Fast Pitch process helped to fine tune our messaging, here is our old mission statement: To offer artistic enrichment, educational programs and transition services that empower incarcerated and at-risk youth between the ages of 13-18 to begin a journey of self-discovery, releasing self-imposed and societal limits on their true potential. Our new mission statement reads as follows: New Earth works with incarcerated youth to interrupt the patterns that lead them to becoming the next statistic. This is done through a series of innovative arts and educational based mentorship programs that nurture self-expression, stimulate positive growth and promote systemic change. The new message has our organization’s name up front and center. It sets up the issue and provides our innovative solution. It ends on the note of systemic change, which is the ultimate goal of our organization. At Fast Pitch, Alex, one of our students who was incarcerated for carrying a gun three years ago, gave a heartfelt account of how our program has led him from jail to college, and from guns to art. Our audiences want to hear from people whose lives we have changed. They want to connect a face with an issue; give them the opportunity by sharing those stories. 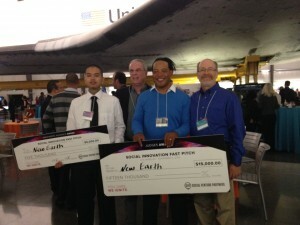 New Earth’s Harry Grammer and student Alex take in the moment at Fast Pitch. After 30 minutes of intense, passionate and high-energy pitches in the shadow of the Shuttle Endeavour, the judges awarded our founder Harry Grammer the top prize, the $15,000 Judge’s Award. Additionally, Grammer received one of the Annenberg Audience Awards of $5,000, as selected via live text voting by the sold-out crowd of almost 600. Yana Simone is the executive director of New Earth.